Daniel Galhardo of TenkaraUSA will be visiting Colorado on Saturday October 22nd and offer an informal on-stream presentation in Rocky Mountain National Park. Please check event details here. This will be a great opportunity to meet Daniel if you missed him at the Tenkara Summit this Summer in West Yellowstone and learn a thing or two. 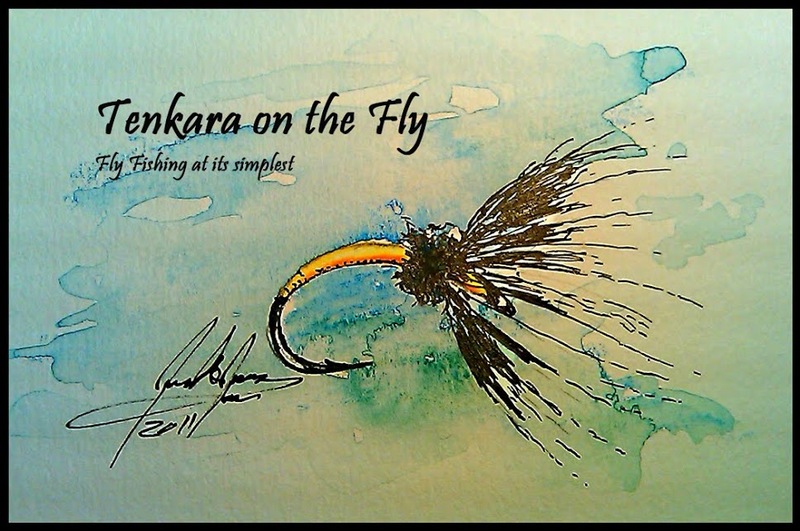 Daniel will also have selection of Tenkara rods and lines with him which you will be able to give a try. I have been living in Colorado for over 3 years now and only this September did I make it up to Vail for the first time! The occasion was to spend a relaxing weekend with the family of my daughter's best buddy Harper and to celebrate my buddy Lyle's birthday (Harper's dad). Heading up on Interstate 70, I was surprised that the Aspen trees have already changed into their brilliant golden Fall colors. The mountains looked like they were on fire! This is most definitively my favorite time of year in Colorado - the days are warm, the nights are cool, the weather is as always great and the colors top it all off. Since it was Lyle's birthday, he requested to go fish Sunday morning - who am I to not comply? 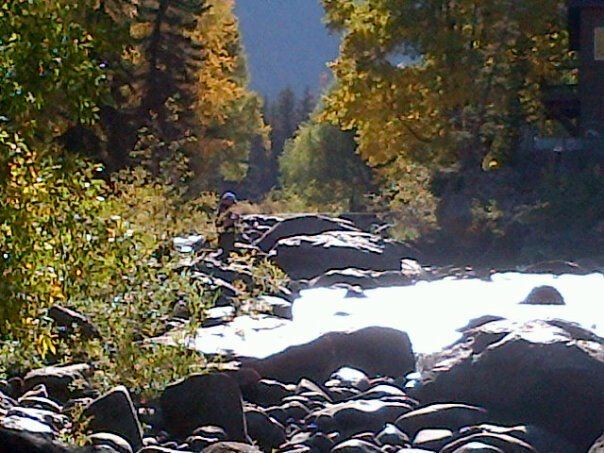 After a hearty breakfast, we headed down the valley to Minturn to fish the upper Eagle River. I never fished this river before but heard good stuff, so there were some expectations in the back of my head. When we got to the river, I was taken back how clear the river was (and cold!). It is a moderate-high gradient river with strewn with boulders and rocks and so clear that you could see every single rock down to the bottom of most pools. Beautiful water to fish indeed and pretty good flow, although on the low end, of around 50cfs. Lyle started off fishing with his "Western" rig with a nymph rig upstream of me while I pulled out the ITO rigged with a 13' no. 3 level line of Tenkarabum (so far, this is the line I like the best on the ITO, although I have a hand-tied 14ft fc line coming soon) with a Mini Hopper from AZWanderings and a small CJ as dropper. I landed two nice browns right away (on the Mini Hopper) but then things slowed down so I watched Lyle for a while and took it slow, enjoying being just out on the river. Eventually, I couldn't resist and changed my setup to a CDC & Elk (of course) and started hitting the slow pockets and eddies. I was able to raise a few fish and even land one but the action was not steady. The best fish came from a run I fished after Lyle was done. 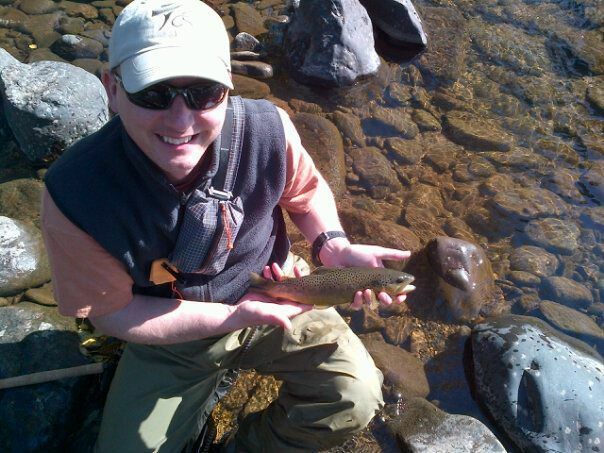 A nice and healthy brown took the dry fly and I was able to land the fist fairly quickly off the fast water. One observation I had was that none of the fish was fighting very hard; I am not sure if that was due to the cold water or whether they "knew" they'd be released. Later in the morning, we moved to a different spot a bit downstream where Lyle finally gave in and tried to fish Tenkara. Well, let me say that he hooked a fish but lost it (and his glasses) while trying to land it. After we were done and heading back up to Vail, he said: "I really enjoyed Tenkara. Much different than my Western rig - the touch and feel is way better. I am really going to enjoy making the transition". It looks as we are having a new convert, especially since he's bumming one of my rods for his trip down to New Mexico this weekend!